Despite a whizbang introduction preceding this year’s Consumer Electronics Show and a generally positive reception by critics, Google’s Nexus One hasn’t found sales traction. Like Palm’s ailing Pre and Pixi, the numbers look surprisingly bleak for a well-hyped and highly anticipated handset. According to Flurry analytics, Google sold just 135,000 Nexus Ones by 74 days after launch, compared to the Motorola Droid, which sold 1.05 million in the same period, and Apple’s iPhone, which sold 1 million. 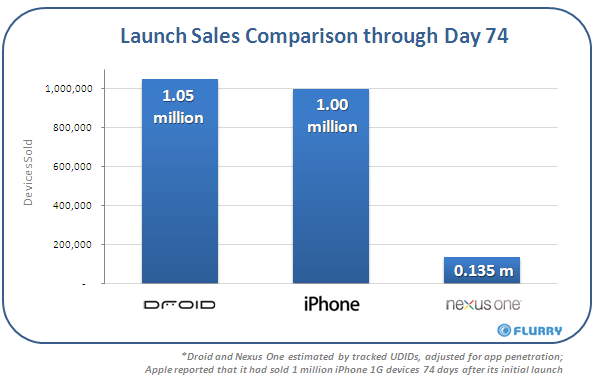 The numbers fall largely in line with the sluggish start Flurry witnessed for the Nexus One back in January, which showed even the relatively tame T-Mobile MyTouch outselling it by three to one in first-week sales. Amazingly enough, the latest numbers only take the first-generation iPhone into account – sales of which pale in comparison to the much more affordable second- and third-generations. 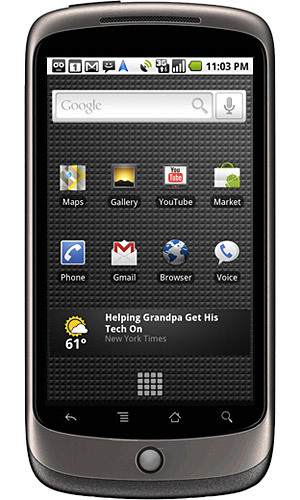 As Flurry pointed out the first time it poked the Nexus One, a number of factors help account for the difference, including Verizon’s decision to launch the droid at the peak of the holiday shopping season while Google whipped out the Nexus One in the lull after, and the Droid’s $100 million marketing budget which helped stir demand. Flurry tracks handset sales numbers using code it has embedded in applications in both the iPhone and Android stores. Although the analytics data the code “phones home” with is used by app developers to see how their apps are used, Flurry also claims its presence on 80 percent of all iPhone OS and Android devices gives the company an overview of sales through extrapolation.